An artist whose portrait of the Queen was defaced with spray paint in Westminster Abbey in June has spoken publicly about the attack for the first time. Ralph Heimans said he was "extremely shocked" by the act of vandalism. The Australian-born artist had worked on the picture for six months, sometimes spending 20 hours a day in his studio in south London. "My first reaction was, did they get the face?" he told the BBC. Media captionArtist Ralph Heimans: "Someone had sprayed purple paint on the work"
The artist revealed he was in his studio when his agent telephoned him to say the portrait had been sprayed with purple paint. "I was terrified the face had been damaged," he added. "The face is the soul of the painting and it's something that is very hard to recreate." Speaking to BBC arts correspondent Rebecca Jones, Heimans said he had jumped in a taxi and gone straight to Westminster Abbey to assess the extent of the damage for himself. A conservation team on site had already begun the process of finding the correct solvent to remove the paint. Heimans said he felt "bewildered", adding "it was quite a numb feeling". "I was on edge during the entire process, until very close to the end, when it looked as though everything was going to be okay," he said. 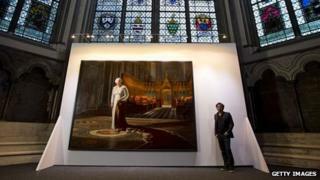 His painting depicts the Queen in contemplative mood, wearing state dress, and standing on the spot where she was crowned in Westminster Abbey. It was the only official painting commissioned to mark the monarch's Diamond Jubilee. Heimans said he had not spoken about the attack until now because "it took a while for everyone to be reassured" that the painting could be fully restored. A man has been charged over the attack and will appear in court again next month. Tim Haries, 41, from Doncaster, South Yorkshire, is charged with causing more than £5,000 of criminal damage.